Are you searching for a fun and easy way to design your own rooms and dream home from scratch? If so you’re in luck, because I’ve put together a list of my favorite free interior design software programs. I hope you’ll have as much fun as I have experimenting with the different software. 1. Designing Idea’s Interior Design Software (Free) We’ve set up a free design app on this site that lets you create and design your own home layouts through your computer’s browser. Through a partnership with one of the top design software providers you can quickly design any room in your home. 2. Planner 5D (Free) Planner 5D is a free online design tool you can use to visualize, create and render your own detailed plans. Using different modes you can create any kind of floor plan you want in 2D and then switch to photo-realistic 3D to add your finishing touches. The online editor lets you choose from a variety of interior and exterior layouts as well as adjust the size, and height of object available from their catalog of 3000k furnishings and decor. You can add furniture, electrical appliances and decor to your design. You can add rooms, walls and dividers by dragging and dropping them where you want. In addition you can choose from a wide assortment of colors, patterns and materials to get the look just right. For instance you can add different wood flooring colors, wallpaper, types of tiles or just about anything you can think of. Once you’ve got your design created you can drag in your favorite decor, and furnishings to create your dream home. 3. Sweet Home 3D (Free) Sweet Home 3D is an open source interior design software, meaning it is completely free to use. Amateurs and professionals alike use it to draw house plans, arrange them with furniture, and see the results in 3D. There are several standout features of this software. You can draw walls and add rooms over an existing home plan image, and on multiple levels. The software allows you to change the colors and textures of the floors, walls, and ceiling as well as import your own patterns if you don’t see ones you like. In addition, you can drag and drop furniture, doors, windows, and choose from a large catalog of 3D models and even download more from the internet created by other users. You can customize the furniture you use my changing the size, color, texture, elevation and orientation to get the exact look you want. The software also has a cool feature that lets you navigate your design using an aerial view or from a virtual visitor view point simultaneously. After you have finished your design you can create a photo-realistic image in a day or night time view. Then you can print or save your home plan along with the 3D view. 4. MyVirtualHome (Free & Paid) MyVirtualHome uses a drag and drop interface to create you own home plans quickly. You can choose from pre-furnished rooms and snap then in to place. Once in place you can customize the space by resizing and fitting doors and windows as you want. If you already have an existing plan, you can import a picture and built on top of it to use as a guide to get just the right look. The software offers a product catalog of furnishings and decor to choose from which you can add to your design. The software lets you change colors, textures and try out a variety of building products to see how they impact your dream home’s aesthetics. 5. Space Designer 3D (Free) This is a great program for drawing floor plans and offers both 2D and 3D perspective. After you have created your home design you can use a function to enter a 3D walk-through experience. You can export your finished creations to create 360° virtual tours you can view and share on your home computer, tablet, or mobile device. Since Space Designer is an online web application is doesn’t need to be installed on your computer. It currently operates on all operating systems and browser standards. 6. FloorPlanner (Free & Paid) FloorPlanner is an online design service that works in your web browser. You are free to use the app but are unable to save your creations with the free demo version. Through the app you can create indoor, or exterior home plans. Plans can be embedded on your own social media account, or website to share with friends and family. The app is also great for real estate professionals who want to create interactive floor plans for their clients. 7. HomeByMe (Free) HomeByMe software lets you draw your own home plans in 2D and select all of the modifications you want and then view the 3D results in real time. For a free program it’s very robust and offers a variety of tools found in many expensive programs. Some of the highlights include the sketch feature which allows you to specify the exact imperial or metric measurements of a wall. There’s also the ability to import your own plan images to sketch on top of. You can customize many home features such as doors, windows, stairs as well as power sockets, gas inlets, power outlets, ac units, and radiators. Further you can include rich text and annotation to your drawing for labeling the name of specific rooms or locations within or around your house. 8. Autodesk HomeStyler (Free) Homestyler is definitely one of the easiest online design apps currently available. Their software runs on your browser and you can use it to create your ideal indoor spaces and then navigate 360° around your new design. Creating interior spaces can be exiting using their more than 10,000 catalog furnishings and items from leading brands to your floor plans. They offer both 2D and 3D modes. However, they currently don’t allow the ability to render your mock-ups or export them. Instead they allow users to take a picture of their design for downloading on to ones computer. 9. RoomToDo (Free) RoomtoDo is a cloud based interactive tool you can use to design rooms to your specification in 3D. They offer a simple interface that uses a variety of decorative materials, furniture, doors and windows to get the style you want. 10. Room Sketcher (Free) Room Sketcher is an easy to use remodeling and home design tool. Creating floor plans can be created using their drag and drop tool. You can design your floor plan in 2D to draw walls, and the program will show you the dimensions as you go. Then add windows, doors, furniture, flooring, and paint to customize with the right materials for your project. You can then take a snapshot of any room you designed and convert it to a high quality 3D image. You can also switch to 3D to experience a 3D walk of your floor plan. 11. Chief Architect Interior Designer (Paid) This 3D home design software is great for DIY home enthusiasts who want to really customize and design their dream home ideas. There are also how-to videos to give you specific instructions on how to operate the program and use its many features. The software offers a massive library of 4,800 architectural objects that can be used to get the style and finishes you want for your design. You can experiment with different color themes, door styles, kitchen countertops, backsplashes, cabinetry, walls, windows, wall coverings, crown molding, flooring, and hardware. Accessories include materials from brand-name manufacturers and if you don;t find what you need you can import your own. 12. Room Styler (Free) By signing up with this web-based interior design software, you don’t just get access to tools that can help you plan your home’s interiors but access to a community of people with home you can share ideas with and get inspiration from. Room Styler has allows its members to display their finished interior designs and share them with other members for comment. You can even like them and join contests were members are asked to come up with designs according to themes. Room Styler allows you to create a room layout then furnish and decorate it. You can either draw your layout using the exact measurements of the room you want, or select a pre-existing layout. There is a library of 120,000 products and features that the site makes available for you to use in your room design. These items are actually being sold by manufacturers such as Ikea, John Lewis, Mooi and others. There are links on-site where you can place an order for your chosen item. Aside from room designs, Room Styler also allows users to create a Moodboard which a collage of different items that you can use in interior designing. You can also browse other people’s Moodboards for inspiration. 13. Olympic Paint Color Visualizer (Free) The Olympic Paint Color Visualizer is an interior design software that is a tool to help you choose the right paint colors for your room. This software is available for free on the Olympic paint website. This software allows you to see how the different colors available from Olympic’s paint catalogue will look like in your real-life room. It allows you to mix and match colors and see what they would look like on the walls, ceilings and trim of a room. To use the Olympic Paint Color Visualizer, you just have to take a picture of the room that you’re looking to paint. Upload the images of that room onto the Olympic Paint Color Visualizer. From there, you can choose from the different paint colors available and apply them to the areas you want. This allows you to see how your room will look with these different colors BEFORE you go off and buy the paint. 14. IKEA Home Planner The design software is made available by furniture giant IKEA so it’s no surprise that the biggest feature of the IKEA Home planner is an extensive gallery of IKEA furniture and decor components that you can drag and drop into a room layout. The IKEA Home planner basically allows you to map out what your room would look like when furnished with IKEA furniture. You can plan your furniture and decor according to the specifications of your home, creating a floor plan that is true to the actual measurements of your home. This ensures that the furniture will not just fit the look of your home but its actual dimensions. Aside from actually allowing you to see what a piece of furniture would look like in your room, the IKEA Home Planner also informs you of how much it would cost and keeps a tally of the overall costs of all the options that you chose. The plan you create can be viewed in either 2D or 3D onscreen. You can also print out the plan and carry it with you to an IKEA store so you can purchase your choices. 15. Lowe’s Virtual Room Designer (Free) This design software is from home improvement company Lowe and can be found for free, on-line on their site. 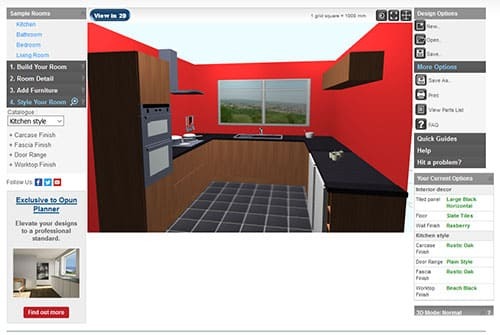 Lowe’s Virtual Room designer allows you to design a room from scratch, using your own specification and measurements or by using a template. There are three types of rooms that you can design with the Virtual Room Designer: Kitchens, Laundry Rooms and Bathrooms. Once you have decided on your room type and layout, you can add products available from Lowe stores into your room design. The specific items that will be available to you will depend on your room type. For example, if it’s a bathroom your going to be offered toilets and water fixtures, while a kitchen design will have the option to add cooking appliances. You will also be allowed to select the colors and materials you will be using on your wall, ceiling and floors. You can view your room from a number of different angles and make changes as you see fit. When you’ve decided on a final design, you can then save and print your design. A shopping list will also be generated for you depending on the options you chose when designing the room. 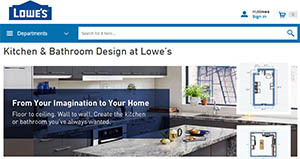 In order to use the Lowe’s interior design software you will need to install their app which will allow access. 16. Small Blue Printer (Free) Small Blue Printer is a free interior design software that can be used online. 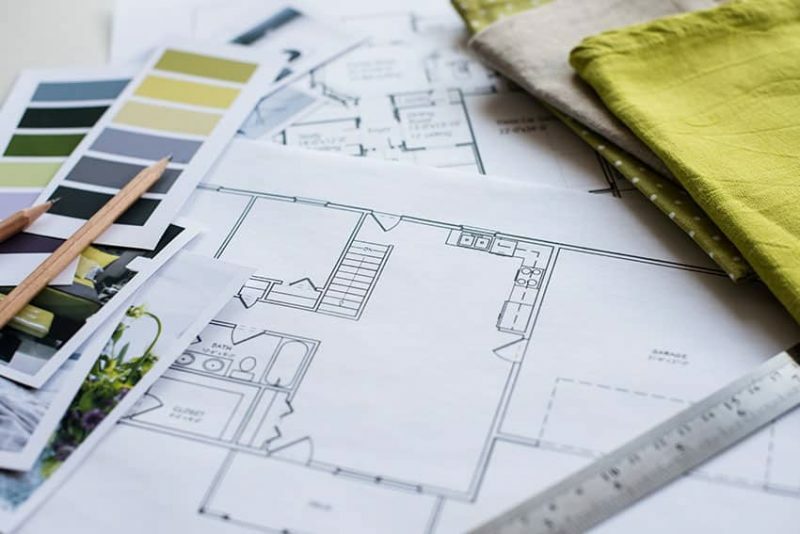 There is no need to download or install anything to use this interior design software to help you create a plan for both the inside and outside of your home. Small Blue Printer can be used for the interiors and outdoor features of your home as it allows you to use two types of software. The first is a floor planning or home planning software and the second is a garden and landscaping software. The floor planning features allows you to create a floor map of the rooms in your house. There is a library of features such as windows, walls and doors that you can drag and drop wherever you want on your floor map to figure out how you want the rooms to look. The garden and landscaping feature is used to plan the outside of your home from the ground up. You drag and drip trees and flowers into place and can even add other features such as paving stones and ponds. You can view your plans either from above or via a 3D walk through. You can also print out your finished plan. 17. SmartDraw Interior Design Software (Free Demo & Paid) SmartDraw Interior Design Software is a paid design software, but you can try it out as well with their free demo offer. This design software allows you to design plans for pretty much any room in a house or even the entire house. The basic package has a floor plan library of more than 10 templates which are easily customized. The plans created using this software can only be viewed in 2D. SmartDraw Interior Design Software comes with an extensive object library which has options which allow you to ad furniture as well as HVAC and lighting fixtures and systems, cabinets, decor and even landscape elements. There is also an option in which you can choose textures which can be used in designing flooring, counter tops and other room features. If you find what’s available lacking, there is also an option by which you can import pictures of objects or materials you would like to include. 18. 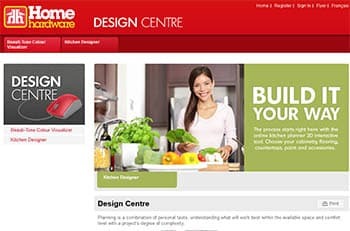 Home Hardware Design Center (Free) Home Hardware Stores Limited is Canada ‘s largest dealer-owned hardware, lumber, building materials and furniture cooperative. At their website, they have a Design Center with two free on-line interior design programs. These are available on cloud and can be accessed. All you have to do is go on the Home Hardware website and click on the software option that you are interested in. The Beauti-Tone Color Visualizer is meant to help you decide which colors work best in your space. Meanwhile, the Kitchen Designer works to help you come up with a design for your kitchen. The Beauti-Tone Color Visualizer requires you to either up load an image of a room or “scene” that you want to color and pick different color schemes for it. You can also choose preexisting scenes and play around with their color schemes. The Kitchen Designer lets you choose a preexisting kitchen layout or to draw your own. You can then add kitchen furnishings and select wall, ceiling and floor colors to decide what your kitchen will look like. The software also creates a shopping list for you based on the selections and options you placed in your design. 19. 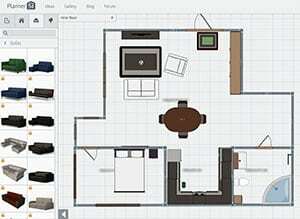 OpunPlanner (Free) Opunplanner is a free online decorating platform that offers a number of tools that you can use to visualize and design a room layout. When you use Opunplanner, there is one area for basic interactive design tools you can use as well as a design gallery where you can see and manipulate other users interior design creations. The start from scratch feature allows you to play around with creating your own personal design or use pre-set room template. You can change the elements of the room’s floor and wall paper as well as its furnishing styles and colors. There are different room layouts that allow you to create a room, specify its dimensions and the placement and style of fixtures such as windows and doors. You can also add and place furniture as well as change the furniture’s size and color. You can then save and print out your created layout. The planner allows you to create a design room planning worksheet that you can save as a file to export or import at a later time. You can then share your creations with others for editing and approval as well as generate a 3D rendering of your home’s design. 20. Home Designer Suite 2015 (Paid) Home Designer Suite is paid software for home remodeling and designing projects. 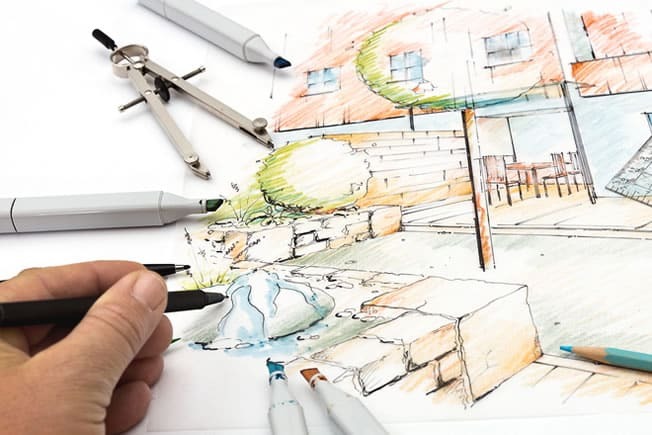 This allows you to design a plan for both the interior and exterior of your home. The Find Plan tool will help you develop an accurate plan for your home, asking you how many floors, bedrooms, and bathrooms you want. As you draw and re-draw the walls of your rooms, the program will automatically offer measurements and update these accordingly. You have access to a library of 6,000 objects and materials that you can use to furnish and decorate your rooms. A tally of what materials you opted to use will be kept to enable you to estimate the cost of the project. The plans can be viewed in 2D and 3D, overhead or from ground level. You have the option to map a path through your home and record a virtual walk-through that you can share. The Landscaping tool allows you to recreate the circumstances and features of the lot your home will stand on. To help brighten your design there is a digital library of 1,500 plants that can be placed in your plan. Vital information on each plant, such as how to care for it and where it would grow best, is provided. 21. HGTV Design Software (Paid) This is an interior, home and landscaping design platform from HGTV and includes a library of how-to videos to provide you with guidance and inspiration when coming up with your own home designs. You may chose between creating your own custom floor plan or using a sample model templates that the. There are two modes in which you can view the plans, 2D and 3D and these work seamlessly together. Whenever you change something in the 2D plan, the change will appear automatically in the 3D model. The HGTV Design Software platform includes over 1,200 objects including furniture and appliances, doors, windows, and lighting features. When you complete your design, you can go through a 3D walk-through which is a virtual tour of your model. You can also create a QuickTime movie of your virtual walk through which you can then share with others. Two particularly useful features of this software would be its lighting simulator and its Go Green feature. The lighting simulator can simulate any time of day and change the lighting accordingly. This can help you decide the best places to have windows, doors and skylights. The Go Green feature helps you design your home to be more energy efficient and have a smaller environment foot print. 22. Live Interior 3D App (Free) Created by Belight Software, this is a free CAD software. With the Live Interior 3D app, you can draft 2D floor plans for your home and then watch as the structure is build up into a 3D model then design and decorate the interior, choosing furniture and colors. You can design and decorate the interior of the floor plans, choosing furniture and colors according to your taste. The software comes with a library of over 1,200 objects, furniture, décor, doors and more. You can also change the fabrics, colors and finishes of your design with a library of over 1,500 materials to choose from. You can fine tune the interior lighting of your design as this software allows you to set the light color and luminosity of every light fixture. You can also adjust the natural light coming from outside by setting the time of day and geographic location. A measuring and annotations tool allows you to take and add notes to the 2D floor plan which you can share with contractors and architects. You can take photos of your design from different camera angles or during a virtual walk-though. You can then share these photos with others through Dropbox, Facebook and email. 23. Cylindo (Free Demo & Paid) Cylindo is a 3D interior design software. Allows you to take your furniture, turn it into a 3D image that you can incorporate into a room design. This gives you an idea of how your furniture will look in that design. First you draw your room floor plan or use a template. Add doors, windows and fixtures, change the look of your walls and floor, drag furnishings onto the layout . 360 HD Viewer shows products in high-resolution quality with 360 degree view and zoom. View products from every angle in HD quality zoom. Room Planner allows you to see what a piece of furniture will look like in your home before you buy it. Draw up your floor plans and design your interior then see it in 3D. Cylindo works with furniture and design companies such as Steelcase, G/F Gallery Furniture, Bohus, and Espasso IDdesign. It provides for easy one-click purchase of these furnishings and is compatible with major ecommerce platforms such as Magento, Shopify, Volusion, Bigcommerce, Woo Commerce, and Demandware. 24. Turbo Floor Plan 3D (Paid) The 2019 Turbo Floor Plan 3D is paid interior design software that allows you to draw up a plan for all phases of your home’s construction. This software allows you to plan almost every element in your dream home including the foundation, HVAC system, electrical system and plumbing. You can draw up the walls and place the window and doors in every room. It even allows you to customize the roof of your planned home. Not only does this software allow you to draw up your room layouts, it also allows you to visualize and plan how each room in the house will look, equipping them with custom cabinets, lighting, furniture and appliances. It even allows you to design outdoor landscapes and features such as decks, fences, paths, lawns and gardens. Turbo Floor Plan 3D allows you to create and play around with color boards which will allow you to use your favorite colors in the rooms decor in order to find the scheme that bests suit it. The Turbo Floor Plan 3D comes with a Training Center, a collection of 100 videos to help you develop your design skills. It also has an automatic cost estimator. Do be advised that this software is Autocad focused and requires a bit of perseverance to operate. 25. Decolabs (Free) A free interior design software app for the iPad, Decolabs allows you to take a photo of your room then browse an e-catalogue of products so that you can select and place to see how they will look in your room, These e-catalogues provide you with detailed and complete product information on the designers as well as all the available models. The app makes use of what it calls Augmented reality, you put virtual furniture objects on real camera pictures. This allows you to make a better evaluation of how a piece of furniture will actually fit into your space. The app offers its users markers that they can print out and place in a room to enable real-time visualization. You can get a virtual glimpse of the decoration of a room in a matter of seconds. Designs can be shared on social media or with Decolab’s community of designers so you can get creative feedback and recommendations. You have the option to share with entire community or only with a select number of friends After seeing how a piece of furniture will look in your room, you have the option to order it through the app. Products come from designers such as Arne Jacobsen, B&B Italia, Cassina, Fritz Hansen, Vitra, Molteni & C.
26. Punch Software (Paid) Punch Software is a paid software that is used by professional interior designers. This design software offers several options and packages so you can design your entire home down to the individual rooms. Punch Software creates designs with a degree of detail that is unmatched by other design software. The plans appear with photo-like quality. Punch Software lets you experiment with different color schemes, lighting, materials, furniture, finishes, paints and more. In the rooms you create, you can place and replace furniture, blinds, curtains, floor types. almost any feature that constitutes home design. An expansive object and materials library is easily augmented by a feature that allows you to import photos and images of what you want. The Color pallet feature allows you to create multiple color scheme and alternate between them until you find the one you like best. You can view the rooms in 26 and 3d and set camera angles. There is also a dollhouse view, wire frame view and 3D walk through. Interior design software with many functions often requires some study and time commitment to learn. This program does require a bit of study to get up to speed and creating your own home designs.